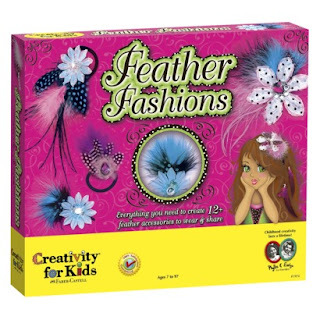 "With this set from Creativity for Kids, your daughter can create fun and feathery fashions. The set comes with more than 50 pieces, including feathers, rhinestones, headbands, hairclips and ponytail holders. Your child can spend hours making fun hair accessories for herself. Or, with so many pieces, you can use it for a fun birthday party activity by letting each guest make an accessory of her own design." In my opinion this product is living proof that the feather fashion trend has exploded into society in a way that few fashion trends do. Of course the projects and jewelry that are made from this set are not at the level that we are looking for with the feather fashion projects that we describe on our blog but still for $20 it is great. The beauty of the set is its simplicity that all you need comes in one package. Let me state very clearly that FeatherStore.com will not benefit in any way from sales made from this post. But because we are all about spreading the feather fashion trend we are happy to introduce other products to our readers. 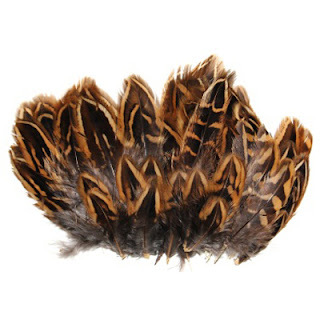 What I would like to do is suggest some additional feathers that you can add to this product without spending a lot more money. 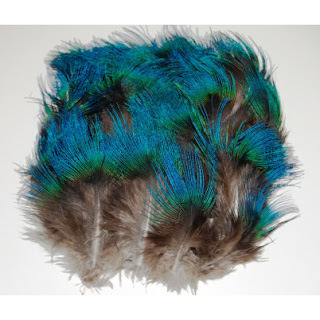 First up are these super colorful peacock plumage ”blue hairy” feathers they are absolutely stunning and $7.95 for a hundred pieces you can add these beauties to all sorts of apparel for extra color. 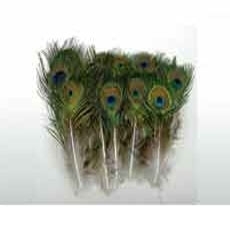 Next are these Peacock Black Partridge feathers which are more subtle in color but extremely pretty. And last these peacock eye feathers, they may be a bit more expensive than the others but they can turn simple jewelry into something magical. Let us know if you buy the set from Creativity for Kids and how it was.